Week Five of the iRacing.com Classic Lotus Grand Prix Series was held at the Canadian Tire Motorsport Park. It was a beautiful, warm, and sunny day at the 2.5-mile (4km) track, and many drivers and their teams were in attendance. Six warm-up races were held leading up to the main Sunday event. Nuno Moreira, last year’s series champion, was still smarting from his DNF last Sunday in Australia and hoping to make a splash this week for his Abilad Williams Racing Team. And, with a little luck, break Team Essex Lotus’ Gernot Fritsche’s three-week win streak! Sunday started out well for Moreira, as he gained pole position with a qualifying time of 1:07.543, fractionally faster than Fritsche’s time of 1:07.554. 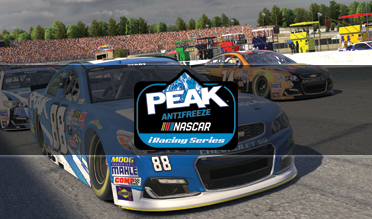 There were 36 cars gridded for the online race, with the slowest qualifier sporting a time of 1:11.979. Much lapping was expected . . .
As the green light went on, the field of cars started well. Scuderia Ferrari’s Gary Larsen had a slight mishap in Turn Two caused by a wheel touching a patch of grass, and Paul Mills of Candy Team Tyrrell executed the same maneuver later in Turn Eight. The first lap ended with 35 of the 36 cars still running, and all drivers and their teams breathed sighs of relief. 35 cars going around a short and twisty track like Mosport can cause a few issues, though. The aerodynamics can be a little odd. Sven Brückner, Marc Dorval (Unipart Racing Team), Mark Pickford (Team ATS), and Harry White (Charles W Clowes Racing) all lost control unexpectedly in Lap Two. Fraser and Pawelski battle through Turn One. There was great driving throughout the race. Unfortunately, 13 drivers were unable to finish. Niclas Madsen of the Warsteiner Arrows Racing Team, his wing-damaged from scraping Larsen’s spinning Lotus 79, missed Turn Nine on Lap Two and had his car towed. Similarly, Shawn Sage missed Turn Nine on the sixth lap and careened into the wall. In that same lap, Scuderia Ferrari’s Roy Cunningham hit the throttle a little too aggressively coming out of Moss Corner and spun out into concrete. At the exact same time, Bill West of Candy Team Tyrrell, sporting slight front-wing damage, took Turn Three wide and slammed spectacularly into the tire barrier. Robert Plumley, also struggling with damaged wings for several laps, finally had to call it quits in the 13th lap after missing Turn Two on the inside. Shadow Cars’ pit crew has some explaining to do, as Cam Walsh’s car suffered a mechanical failure that caused Walsh to withdraw. 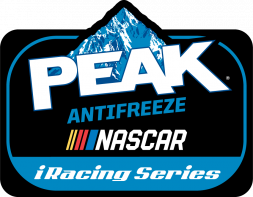 In Lap 26, Matt Pawelski and RAM Viceroy teammate Bill Fraser were dueling closely until a slight tire contact between the two caused Pawelski to slide into a tire barrier and withdraw. Roger Andersson, fending off a challenging Team Marlboro McLaren’s Vincent Chavatte, had a big bug splash his visor at the same time as his car hit a curb, and his car flew out of control. Dobie reclaims P5 from Raina. Moreira, starting from the pole and racing a flawless, 0-incident race with the fastest-lap time of 1:08.722, led the field all the way to the finish line. Fritsche was right on his tail throughout the race, finishing a mere six seconds later. Fraser took P3, exhausted from his 26-lap duel with Pawelski. Marko Kiikka of John Jordan BRM finished fourth from his 11th-place start after chasing and passing Juho Raina (Cliff Smith Racing), and defending against Moreira teammate Sam Dobie. Dobie, starting and finishing fifth, had to fight his way back after losing (what else?) five spots during a Turn Two spin on the 17th lap. Moriera completes a lights-to-flag triumph. Fraser secured the final podium spot after a race-long battle with Pawelski. Next week’s racing will be held at the ultra-short and narrow Lime Rock Park! This course promises a lot of challenging and exciting sim-racing. We hope to see you there! 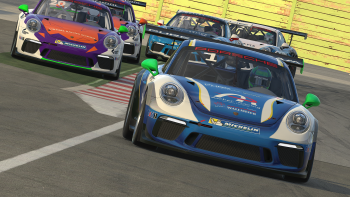 The main SoF race will be held on Sunday the 9th of March at 16:30 GMT.